The 4th edition Dungeon Master's Guide takes it's name literally: it's genuinely full of extremely practical advice for actually running a game. Page 42 is the best new thing in 4th edition: advice and a simple table on dealing (coping) with improvised player actions. There's also a brilliant, easy-to-follow walkthrough, using these tools to play out the kind of "swing on the chandelier and kick him into the fire" action that typically drives GMs mad. There are now rules for running "skill challenges" – multi-round, skill-based alternatives to hack-n-slash combat. The examples cover everything from court intrigue to interrogation to getting lost in the woods. This solves one of my biggest complaints with 3rd edition D&D, explicitly encouraging non-combat encounters that don't melt down into arbitrary die rolls. The old encounter planning guideliness – Encounter Level (EL) and Challenge Rating (CR) – are largely gone. Based on the number and level of the PCs, you have an XP "budget", which you spend to buy monsters, traps and so forth. Individual monster XP is largely based on level, but can be adjusted with simple add-ons. Much about monsters has changed. In 3rd edition, monsters are built like characters, with all the same technical minutiae. 4th edition monsters are slimmed-down, simplified characters, with a compressed presentation that, for even the highest level monster, would fit on an index card. The 4th edition Monster Manual does not include much, if indeed any, information on what the monsters eat, where they sleep, or their favorite color. (This was easily half the text in the 3rd edition.) The new manual does include detailed tactical advice, or suggested attack sequences, for almost every monster. One nearly universal monster option is the "minion" (or "mook", if you've been playing Feng Shui). Minion monsters still attack and threaten the PCs, but have essentially one hit point. For those "Stormtrooper" moments, when you want the PCs to hack through dozens of bad guys each turn, minions are great. 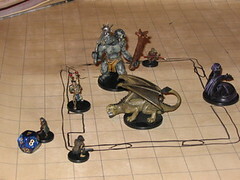 Every monster "category" includes a variety of suggested encounter groups by level, such as "5 goblin thugs, 3 goblin archers, 3 dire wolves". You could easily put together such an interesting encounter at a moment's notice. Monster traits are less common among different monster types (in other words, instead of 10 monsters with some kind of "improved grab" or "flyby attack", traits are more likely to be unique, or at least, unique to a broad "kind" of monster). I didn't see any monsters with spell resistance, easily one of the most frustrating properties to play against in 3rd edition. Humanoid monsters (goblins, drow, gnomes, etc.) are presented in a special appendix of racial traits, all the information needed to create more detailed, PC-like NPCs. In case it doesn't show, I quite like this edition of D&D. While I didn't quite hate 3rd edition, I didn't very much like it, either. I'm not a die-hard, life-long D&D fan. I've played more games in the last few years from the forge than D&D. But I've long wished that D&D would plant itself firmly in the "gamist" niche – a niche that indie games largely avoid. Sure, maybe I don't want tactical combat every week, but when I do, I'd like there to be a brilliant game that handles it smoothly. 3rd edition D&D, despite it's best efforts, was never going to be that game – not for me, anyway. I think 4th edition could be that game. It's bizarre but – mainly by losing lots of it's 30 years of established cruft – this very mainstream game now feels eerily like an indie game. Albeit one that's less open-ended, less narrativist than most indie games, sure. But, still. Unlike 3rd edition's "one game to rule them all" sprawling everygame, 4th edition draws a tighter focus on the three big questions – questions that have grown out of the indie rpg movement. D&D4 may not be the "game I'd take to a desert island" (I'm looking at you, Ticket to Ride: Europe), but it's the best "go into a dungeon, fight bad guys, take their stuff" game I've seen yet.